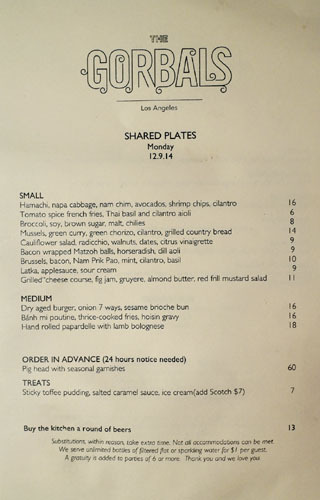 I have to give Ilan Hall credit for opening up The Gorbals in late 2009 in a somewhat sketchy area in Downtown, well before the likes of Bäco Mercat, Zo, and the like moved in. 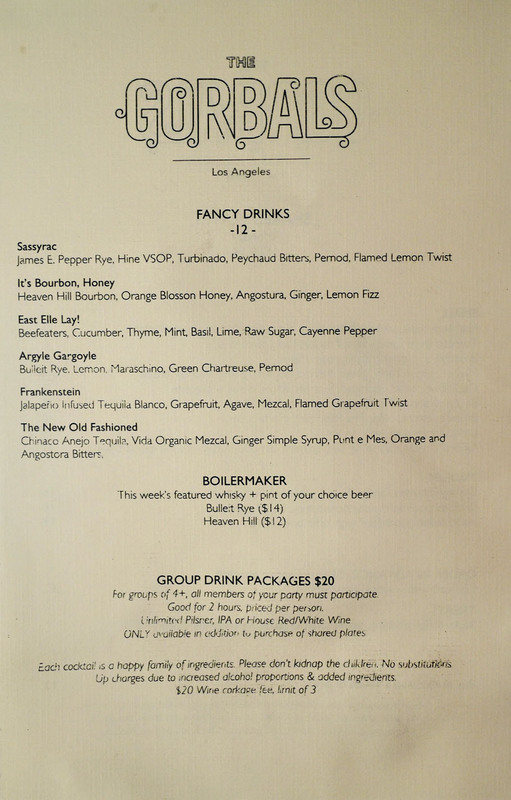 Set in the historic, haunted Alexandria Hotel, The Gorbals has been a solid mainstay in DTLA for over five years, and even debuted an attached sports bar, Bar Mitzvah, back in June, which links the restaurant with a new entrance on 5th Street. However, Hall and company recently announced that they'll be vacating their current location on December 14th and looking for a new spot in Downtown. 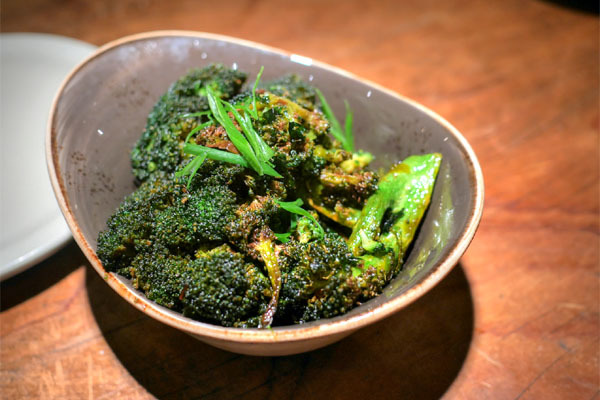 This follows the opening of an outpost of The Gorbals in Brooklyn, and is ostensibly driven by the Chef's desire to have a brighter, more intimate space such as he has in Williamsburg. Another surprise: the new eatery's menu is supposedly going to be most vegetarian. 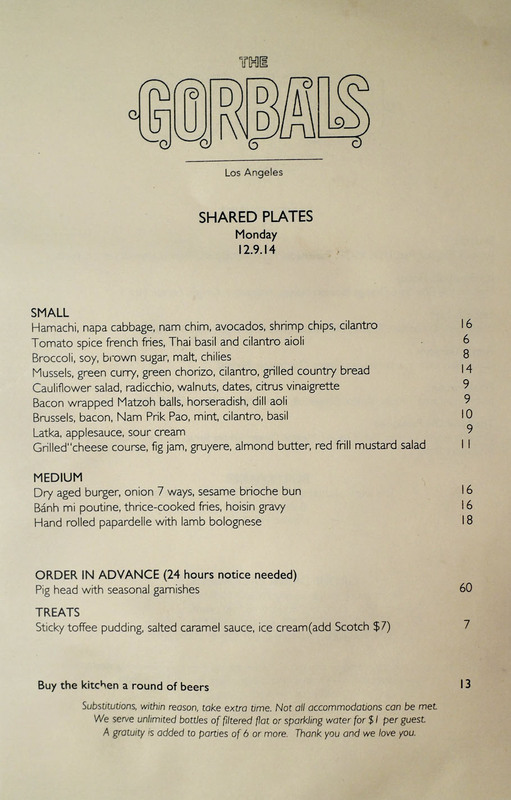 As such, we wanted to pay The Gorbals a visit before its shutter, to give the kitchen's current selection of cozy dishes one last go around. Once you get past Bar Mitzvah (which was completely dead), the inside of The Gorbals remains much as it has been over the past several years. 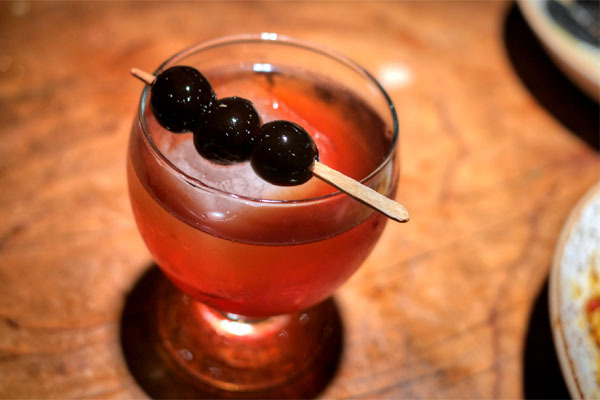 Fashioned from the Alexandria's former laundry room, the space is warmer than it has been in the past though, and also served as the stage for Esquire Network's Knife Fight, which is of course hosted by Hall. These days, the menu is largely in the hands of CdC Peter Haller, who came to The Gorbals from Waterloo & City (also closing at the end of the year). It's more structured than it was during the early days, though it keeps the same charm that it's always had. 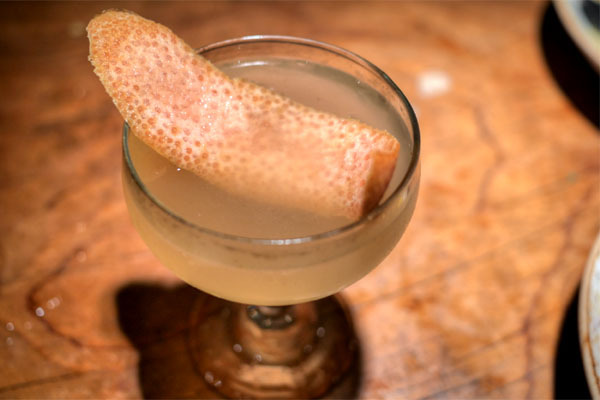 Drink-wise, there are half a dozen beers on tap, a handful of wines, and now, a formalized cocktail list. Corkage was $20 a bottle, though it was waived when we kindly asked. Click for larger versions. Since The Gorbals only had six cocktail on offer, we decided to just get them all. The first was my least favorite. 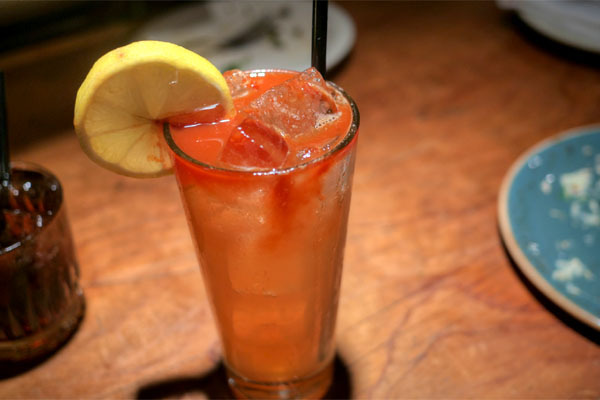 I found it on the watery side, and quite muddled when it came to flavors, giving up just a weak bittersweetness with no ginger. This one, at least, had some actual taste, with an herbal, botanical bent up front, a palpable sugariness in the middle, and a finish of cayenne spice that gave us quite a kick. 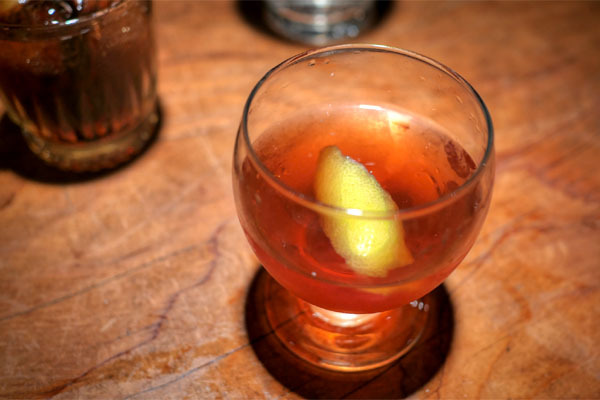 Here was a play on the Sazerac, a viscous concoction with a boozy base overarched by sweet, astringent, and anise-y notes and just a whisper of lemon. The meal got off to a great start thanks to the broccoli, some of the best I've had. Think super savory, super deep flavors, char, tartness, and spice, all set against the crisp, bitter stalks of the veggie. Bacon-swaddled matzah has been a staple and a signature at The Gorbals from pretty much the start. 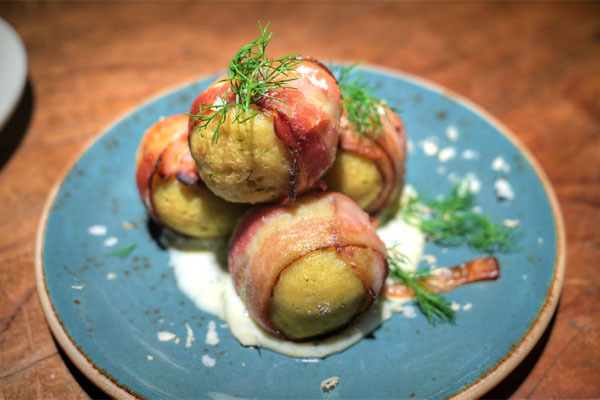 I really appreciated the saltiness of the bacon and the creamy tang of the aioli, and it worked with the balls, but I wanted more of it to counteract the inherent blandness of matzo. One of the night's standouts was undoubtedly the hamachi. 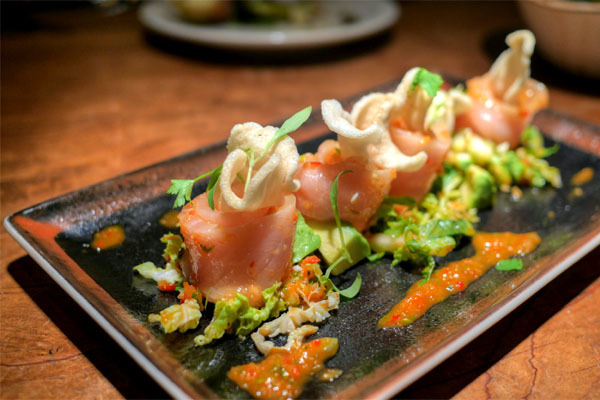 I loved how the Asian-y slant of the dish worked alongside the yellowtail, a mish-mash of herbaceous, sweet, tangy, spicy, and funky that paired beautifully with the fatty fish. This next cocktail was probably the best of the sextet. 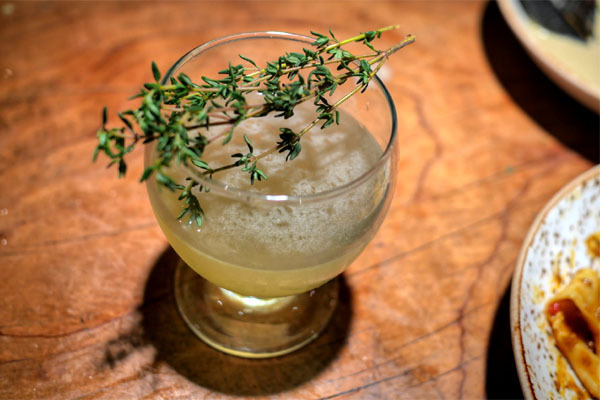 The key was the herbal, vegetal nature of Chartreuse, which melded swimmingly with the various sweet, sour, and boozy elements here to make for a well-balanced, somewhat cerebral drink. 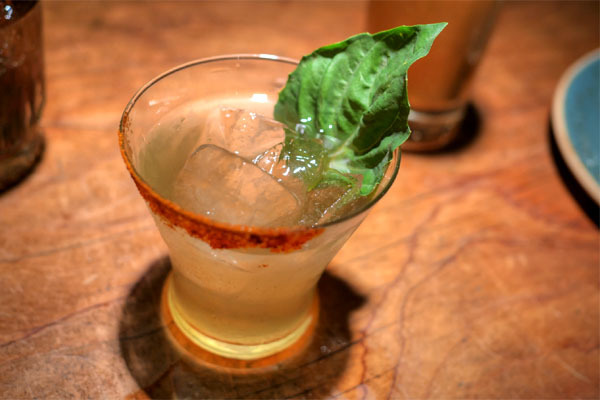 The first of two cocktails featuring mezcal, this one worked out pretty well, a mélange of spicy, sweet, and sour nuances augmented by the smokiness of mezcal. Last up was a thoroughly reworked version of an Old Fashioned, one that demonstrated the powerful, yet somehow restrained flavors of the tequila-mezcal combo alongside a multifaceted bittersweetness. 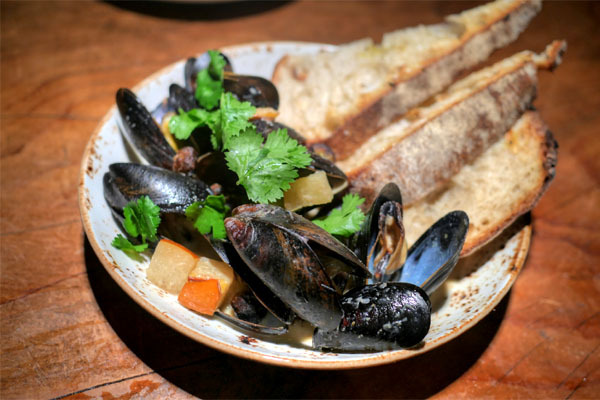 Mussels were well-cooked and nicely-textured, but were overwhelmed a bit by the sweetness of the accompanying curry, the brine I was seeking masked. Great hit of cilantro here, though. 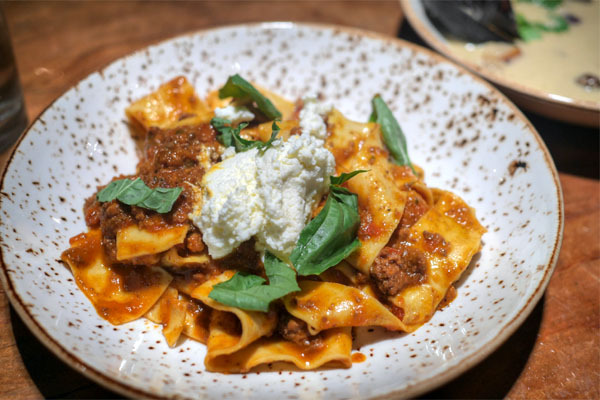 The pasta course satisfied in a straightforward manner, the classically-leaning savory, sweet, tangy ragù working seamlessly with the papardelle. 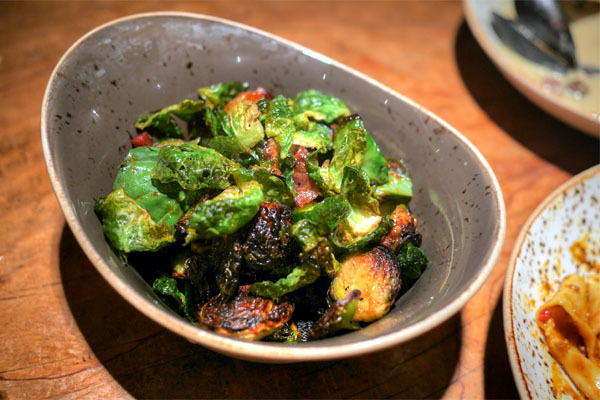 The kitchen really delivered with the Brussels, one of the tastiest preps I've had in recent times. I loved the bitterness and firmness intrinsic to the veggie, so I appreciated how those facets were conveyed here, joined by an immensely savory, South East Asian-esque earthiness that permeated everything. Yum. 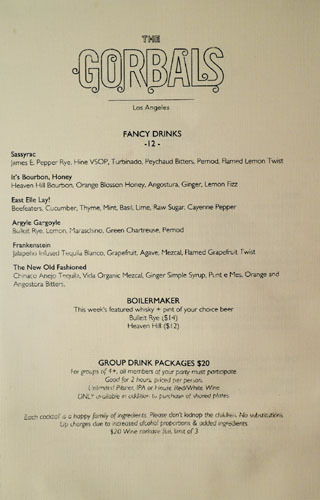 Given the brevity of The Gorbals' cocktail list (and the beverage selection in general), we brought along a couple beers. 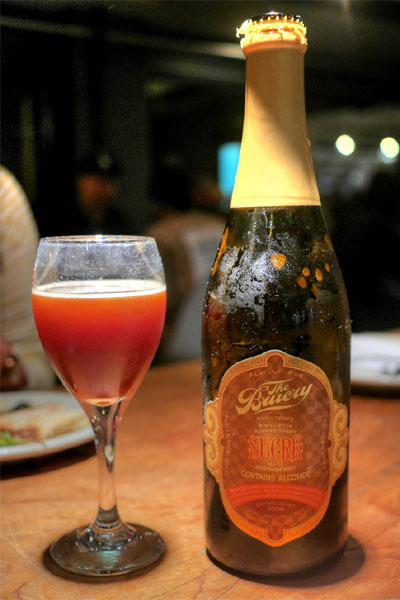 First was the 2014 The Bruery Sucre, the brewery's latest bourbon barrel-aged anniversary old ale. It was as delicious as you'd expect: a flavor bomb just teeming with juicy notes of dark fruit, oak, brown sugar, chocolate, and bourbon, underscored by a touch of alcoholic heat. 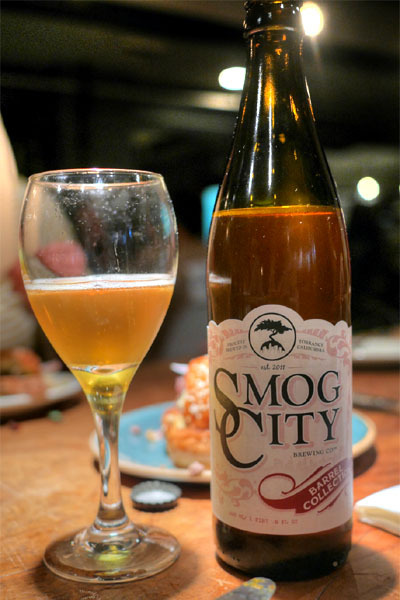 Next was a bottle of the 2014 Smog City Goldie, the brewery's first barrel-aged release. A strong Belgian-style golden ale aged for five months in bourbon casks, this one was smooth and viscous, with rich flavors from the wood to pair with the beer's fruity, estery sweetness and spice. 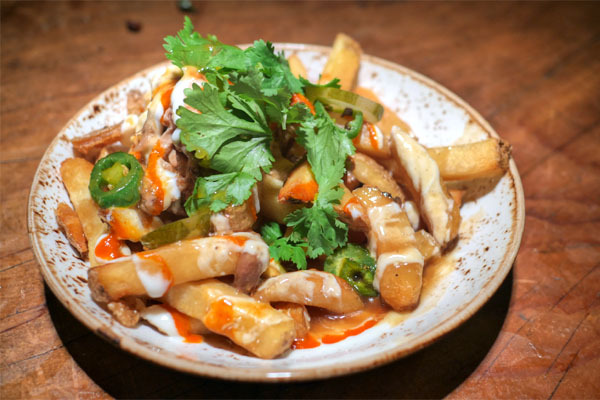 The Gorbals' Vietnamese-inspired take on the Canadian classic is another one of the restaurant's most well-known dishes, one that was ostensibly a result of a staff meal gone awry when the staff replaced bánh mì baguettes with potatoes. I'm not sure if this really tasted all that much like its namesake sandwich, but nevertheless, it tasted damn good, with the savory shards of pulled pork pairing gorgeously with the crispy frites and hefty cheese-gravy while the pickles added a touch of levity to the mix. Latkes were tasty, nicely crisp on the outside and really conveying the simple savoriness that is potato. Traditional pairings of apple sauce and sour cream, meanwhile, were put to good use as well. The burger featured dry-aged beef, and indeed, showed off the earthines and depth that you'd typically associate with such a thing. Sadly, the patty came out a bit on the dry side, but the ménage à sept of onion did help save the day, offering up an array of sweet, tangy, astringent flavors to round out the dish. 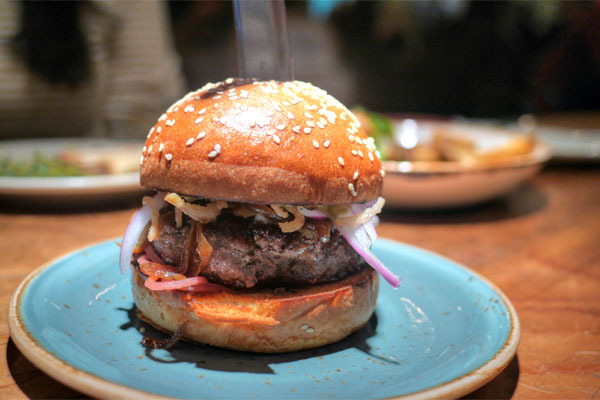 Officially, the seven types of onions are grilled onions, caramelized onions, crispy shallots, onion brioche bun, red wine red onion marmalade, scallion aioli, and pickled red onions. However, I'm pretty sure we didn't that all that tonight, and one of the cooks named off raw, pickled, caramelized, fried, aioli, and ketchup. Nonetheless, it was pretty neat how they mimicked the classic burger accoutrements using only onion. 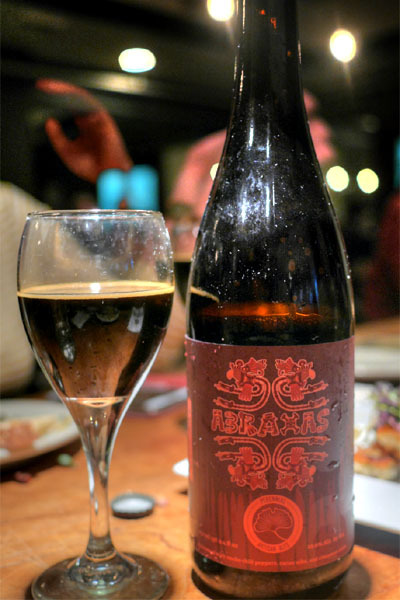 To go with the sweet stuff, I opened the 2013 Perennial Abraxas, which I'd been curious about for a while now. The beer was brewed with ancho chiles, cacao nibs, vanilla beans, and cinnamon, making for an ultra smooth, delicious tipple, with tasty notes of spice, sweetness, and tingling heat presented over a base of chocolate-y goodness. 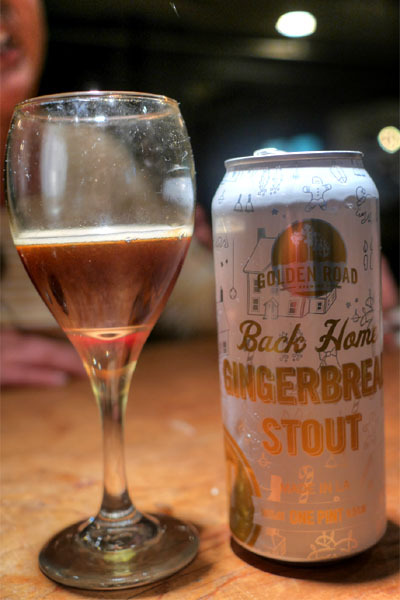 Lastly, we had the 2014 Golden Road Back Home Gingerbread Stout. It really did recall its namesake treat, giving up plenty of ginger-y sweetness and Christmas spices to pair with the beer's stout-y base. 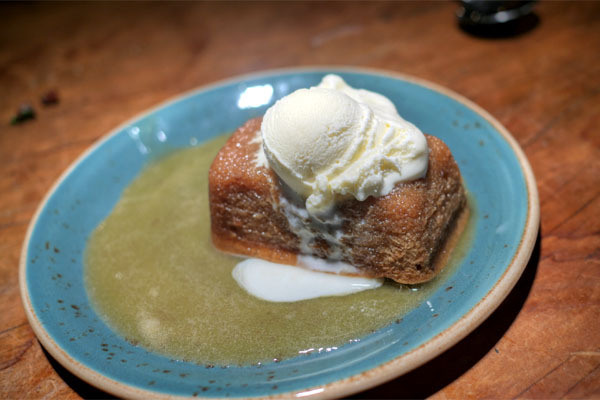 The Gorbals' lone dessert remained much the same as on my first visit here, a classic rendition of sticky toffee pudding that I found not particularly exciting, but still satisfying, especially with the hit of salt in the dish. I'm a bit disheartened to see The Gorbals close up shop, and I'm glad I made it back for one last go around. 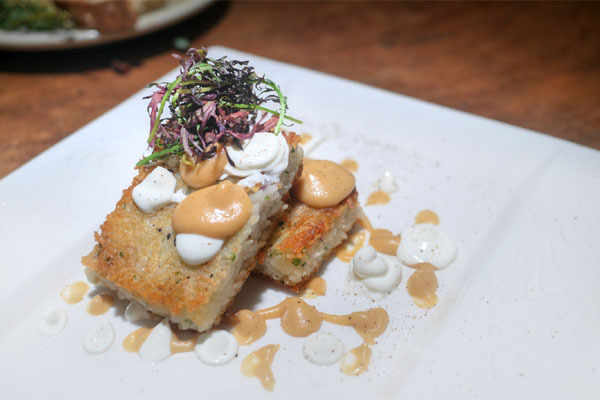 The cooking here has always had a comfort food type leaning, but with a carefree, worldly attitude to it, so it'll be interesting to see how much of that translates to the vegetarian-focused menu at Hall's new place. We shall see.